II'm afraid we'll be completely in the dark about the PS4 vs. XBO NPD battle in the coming years. May the best PR win. Pretty much, we will see PR set pieces independent from NPD regarding sales, like the black friday Sony PR from last year iirc. Most likely there will be worldwide talk, shipped numbers etc. Especially from both Sony and MS for the next-gen consoles giving their products as much positive numbers fluff as poss.. Terrible second month for Pikmin 3. It performed better than TW101, but >60% month-over-month drops isn't good for Nintendo (or confidence in Wii U software) at all. This >60% month-over-month drop is based on retail sales in august (105k) or total sales (115k)? Still no 3DS number? I'd like to know if it's up or down yoy. Also, is there a more specific Vita number? Are we talking about something like 41-42 or possibly 45 and up? Down, I believe. And the 41-42 sounds good. No....no....no.....this makes me really sad. This and that the W101 did slightly below 20K. These two games were the most fun I have had in gaming in a very very very long time. Sometimes one wonders, why do really good games do horribly, while arguably the ones with lesser quality do much better. Now, I am not saying these games like GTAV are bad by any means, they just feel that they are missing some of the charm that games like W101 and Rayman Legends deliver. GTAV is not a good example of a game "missing charm". I had no expectations on September, good, bad, or indifferent. I was only commenting. The only expectation I expressed was October, and for it to settle back down at 10-12k per week before, of course, picking up in November and December with holiday shopping. However, I further expect it to finish behind Xbox 360 and PS3 this holiday, and possibly behind PS4 and Xbox One (if they have enough supply), and I don't think that should be encouraging at all. Wii U couldn't break 100K after a price drop and with a bundle. Is you setting an expectation for what the price drop should have done. And even then for this console it is a good showing. It sold in one month what it had been selling for three prior combined. i think the wii u could have broken 100k if it had an accompanying tv campaign. how much is hard to say, but nintendo seems to be moving away from the idea that they need to use television to sell all but their biggest things. the pokmon 3ds xl wasn't advertised on tv, and yet it seems to have given the 3ds a tremendous boost over last month. as it stands, from april to august, weekly sales averaged out to be around 8-9k. there was about a 2k split at the most, but it was a pretty consistent floor for the console. had this actually continued for the first three weeks of september, then that was about 24k leading up to the price drop. then it did 71k in the two weeks following the price drop. it's a fairly massive improvement, and we might have seen even better numbers had the drop occurred earlier in the month. of course, if people were not buying consoles in early september because of the announcement, then post-drop numbers were even higher, but that would be including people who were set on buying the console anyway and decided to just wait a couple of weeks. i think nintendo has to advertise wii party u and wii fit u, so we'll start seeing the effects of increased awareness about the system starting in october. the two biggest games out that month won't be out until the very end though- might be a similar situation to tww hd for sonic at the very least. november's gonna be really interesting. two system launches, ps4 with some (now less) bundles, nintendo purportedly with a couple bundles (skylanders and nsmbu+nslu), nintendo with their new mario game, xbox one with kinect and many exclusive games. it's super crowded, and there's room for all of those to sell very well. and on top of it all is the 3ds with a newly released pokemon heading into the black friday season, as well as a special 3ds xl for all those zelda fans who haven't bought one yet. oh, and no one can forget the game of the year, tearaway, which is guaranteed to sell a million copies and bring the vita to the forefront of the gaming industry. Not too confident in Wii Fit U. I think it would have made more sense to release it next holiday season. It's kinda baffling though that they haven't found something as good as Wii Sports. Their HD facelift and DLC only sold on the eShop is confusing and only moderately appealing. There should be something new Wii Sports-related on the shelves. They like logic. In the rest of the world, you can get that information just fine for movies and TV shows, but not for video games, unless, in the US, you pay for a subscription. As you pointed out, we only started distributing those new games a week ago, but already more than two hundred thousand consumers had purchased at least one out of those four games by last Sunday. We employed no mass-media advertising so we think we are off to a good start. I think that was rather impressive. Certainly this has inspirated Nintendo to be more experimental with their pricing. I have them all listed just a few posts above you.. The 3DS number isn't right, but the rest are the thread consensus. But thanks for answering at least. I guess it's good that they want to try a new approach, but I think it will fail. It's good how well the Mii Plaza DLC did, but it didn't exactly sell systems. Wii Sports sold Wii's. It's not with that model that it's gonna sell Wii U's in my opinion. Hopefully the game does well, but they've turned a system-seller into a game that sells to existing owners. i think wii sports club is happening the way it is because they didn't have the time to make a full game, they wanted something out for the holidays, and even a full hd remake of wii sports with the online stuff wasn't going to be ready by the holidays. i expect to see a retail release sometime next year. Looking at Vita for a moment to see if any parallels can be drawn for Wii U.
Vita was selling at 4K/week prior to the price drop and Walking Dead bundle. The month of these events it sold 29.5K, with those SKUs out for ~2 weeks. Assuming about 8K for the two weeks prior to the new configurations, that would leave around 21.5K, so a post-price drop weekly average of about 11K within the tracking period or a 2.75x increase. This month it's sold around 41K, or a weekly average of ~8.3K, so an approximate doubling of the baseline, but a 25% reduction from the post-price drop peak. 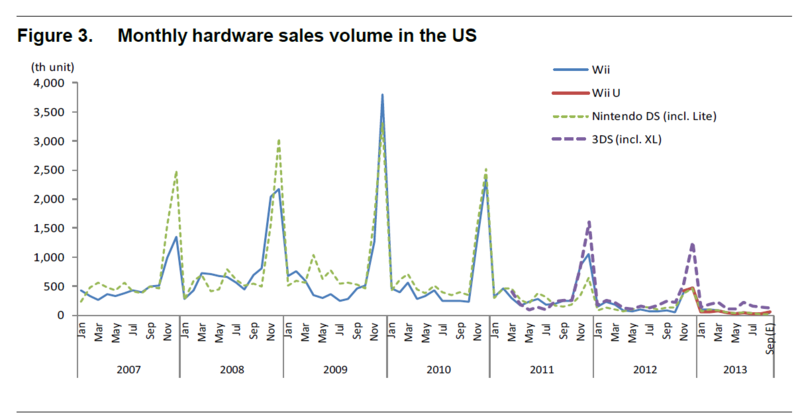 Wii U was selling around 8K/week in August. It sold around 95K this NPD, with about two weeks of new configurations. So an approximate weekly average of 36K post price drop or a 4.5x increase in those weeks. In theory the Wii U could see something like an 60K month for October if it also sees a baseline doubling. Or it could see an 100K month for October if it only sees a 25% drop from the post-price drop weekly average. Of course this is just speculation based on incomplete information. For example it's entirely possible that Vita hasn't seen a baseline doubling and it's sales were, for instance, something like 10K, 9K, 8K, 7K and 6K, through the weeks of September tracking on it's way back to it's past sales. PSV is >40K. 3DS is top selling hardware, so greater than 216K. Rayman Legends < 70K; Wii U SKU 38.85K or less. Kingdom Hearts 1.5 HD between 270-275K. Fantastic! thanks for the thread compilation Shinra. Now after this we enter the most interesting time of the year. I can't see how Nintendo would resist giving the 3DS numbers in the next report. Also those are some really solid Zelda numbers considering the user base, the amount of development investment and the high price (50 USD) this remastering was sold at. Nintendo should definitly sacrifice some resources an put a remastering of Twlight Princes and Skyward Sword for the 1st and 2nd half of 2014. How are the chances for PS3 to beat the 360 in the next month's report? I was wondering why Gamestop had no KZ:M bundle for Vita for the black friday but seeing how the Walking Dead bundle is doing it makes a lot of sense to just keep advertising that one at 199. Also obligatory lol at Brain Age. That's one nintendo IP that would actually benefit from being offered for Android and iOS with in-app purchases. You might be joking, but if 2D Mario couldn't rope in the "casual" gamer 3D Mario has no shot. It might pull in some that have yet to buy the platform, but I'd wager there's almost a nonexistent casual market on WiiU. Still no Project diva numbers? I suppose we have to wait Nintendo presentation at the end of the month to know 3DS hardware number. yah but by less than a handful! Is this in reference to 3DS sales? So 3DS > 216K but not much more than that? If so, thank you so much! We now have the full spectrum of September 2013 NPD sales! "Handful" probably refers to five, which would put 3DS at ~220K. Still waiting on the Nintendo reports to give a more firm confirmation, but that should at least be a good guess with the clues given. Gracias! i think the wii u could have broken 100k if it had an accompanying tv campaign. It also may have if the price cut affected Amazon. A lot of people just go there when looking at online prices for things, and the system still hasn't reached $300 on there. Monthly Nintendo NPD performance, according to a major financial institution. September's figures are estimates. wow. that's a big drop for the DS between holiday 2010 and holiday 2011. Get 94 pixels for 3DS and 93 pixels for PS3. Using 216K for PS3 => 218K for 3DS. Yes! Prediction results incoming. This is very close. I'm glad Nintendo revealed the numbers for the consoles this month. Also, one more tidbit of information. Zelda bundle helped a lot the Wii U.